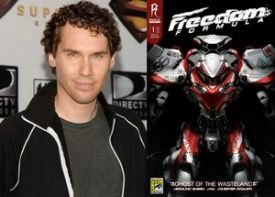 Bryan Singer to Direct Radical's "Freedom Formula"
Radical Publishing is proud to announce that Bryan Singer, director of X-Men, X2: X-Men United, and Superman Returns has signed on to produce Freedom Formula: Ghost of the Wasteland based on Radical Publishing’s Freedom Formula, written by Edmund Shern. This is the third film deal by Radical Publishing, following the announcements of John Woo being attached to direct Caliber and Peter Berg producing and developing to direct Hercules. Freedom Formula: Ghost of the Wasteland #1 of the 5 issue miniseries makes its debut at the San Diego Comic-Con and will be available in stores on August 6th. Singer’s Bad Hat Harry Productions and Radical Pictures will produce Freedom Formula with Bryan Singer and Radical Publishing’s President and Publisher Barry Levine as producers. Radical Publishing’s Executive Vice President Jesse Berger, Edmund Shern, Alex Garcia and Michael Zoumas are signed on as Executive Producers. “Creator Edmund Shern and I spoke about finding a property that originated in the Asian market, but was easily adaptable as a North American property. All he did was show me one image of the mecha, one paragraph of its characters and the world, and I green-lit it immediately” explains Barry Levine. Set in the future, Freedom Formula is a modern day Top Gun, where racing exosuits replace the classic, high flying fighter jets, establishing a dangerous new breed of illegal racing. The story follows a genetically engineered racer who discovers that his bloodline possesses the power to change society. Through a series of cataclysmic events, our protagonist comes face to face with his destiny and a means for revolution. Radical Publishing, Radical Pictures, Barry Levine, and Jesse Berger are represented by Alexis Garcia and Adam Levine with Endeavor Talent Agency and managed by David Schiff with The Schiff Company. Bryan Singer and Bad Hat Harry are represented by Mike Eisner with William Morris Agency and attorney David Feldman. Freedom Formula: Ghost of the Wasteland #2 (DCD# JUL084189) is featured in July 2008 Diamond Previews catalogue and will ship in September of this year. Freedom Formula: Ghost of the Wasteland #2 will ship with two covers one by Chester Ocampo and one by Kai of Imaginary Friends Studios. Radical Publishing is founded by BARRY LEVINE (Producer for Universal Studios, Spyglass Entertainment, Film 44, and Radical Pictures’ HERCULES, Lion Rock Production, Infinitum Nihil and Radical Pictures’ CALIBER, and Bad Hat Harry Productions and Radical Pictures’ FREEDOM FORMULA. Executive Producer for the in development Warner Brothers’ REX MUNDI movie, written by JIM UHLS, starring JOHNNY DEPP and Universal Pictures’ R.I.P.D), his protégé JESSE BERGER (Executive Producer of HERCULES, CALIBER and FREEDOM FORMULA), and longtime writer/publisher DAVID ELLIOTT (Atomeka Press and Tundra Publishing).